nymea is an advanced open IoT platform written in Qt. The main purpose of nymea is to provide a collection of tools, libraries and services to build IoT devices. Nymea can be used to solve specific small problems for IoT based use cases as well as building a fully featured automation platform. nymea consists of three parts: nymea:core, nymea:ux and nymea:cloud. nymea:core is the core piece of the platform. It refers to the services and libraries used to build the edge device. It may run on a low end IoT device, on a Raspberry Pi, on a Linux PC (or VM) or even in a cloud server instance. A typical smart home setup for instance would run a nymea:core on a Raspberry Pi in a home network and talk to IoT devices in the home via WiFi, Bluetooth, ZigBee etc. A smart hot tub for instance would run nymea:core in a embedded device in the Hot Tub (e.g. a Beaglebone Black, or a Raspberry Pi) and control the hot tup through GPIOs. A self-hosted if this than that instance may run nymea:core on a AWS server instance and connect to various other web services. nymea:ux refers to the user facing frontend of a nymea system. This can be a client app running on a phone, a frontend app running on the IoT edge device too (in case it has a display) or a command line interface. Please refer to the Clients page for available frontends. 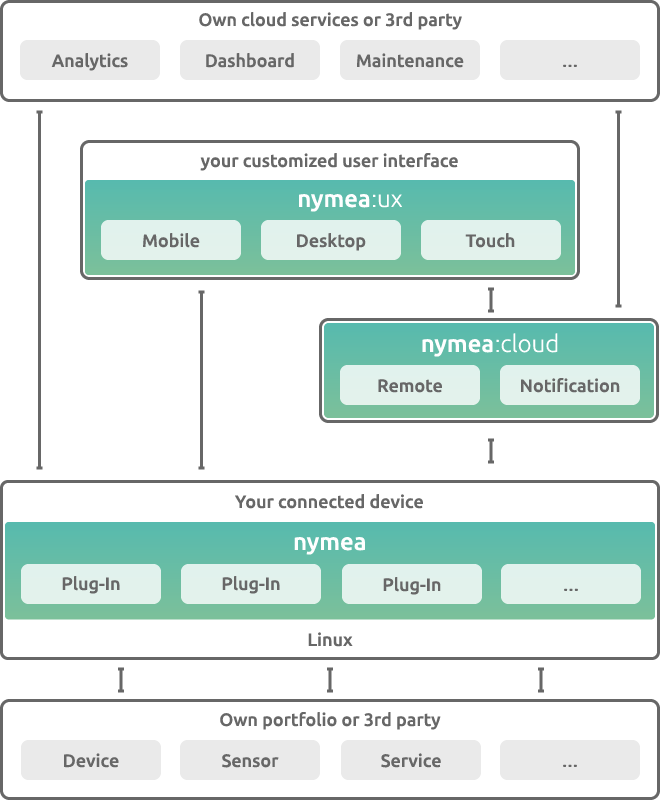 nymea:cloud is optional and extends nymea with cloud centric features such as delivering push notifications to client devices or enabling remote connections from nymea:ux to nymea:core in an easy to setup and secure manner. The project is initiated by guh GmbH, the company behind nymea.io. The purpose of it is to deliver full-stack IoT services and the nymea framework plays a key role into that.